When you are walking alone, listen to the sermon preached to you by the flowers, the trees, the shrubs, the sky, the sun and the whole world. Notice how they preach to you a sermon full of love, of praise of God, and how they invite you to proclaim the greatness of the one who has given them being. The other night I had an argument with my husband. By the end of it, I lashed out in anger and frustration over something – something that had nothing to do with what had started the argument. Basically, I’d given him my worst version of myself in the heat of that moment. Afterward, I didn’t want to face it. I didn’t want to look myself in the eye or try to repair the damage with an apology. When I finished putting the kids to bed, I told my beloved I was going out, that I needed to get away for a little while. I didn’t know where I was headed or what I thought I’d accomplish in this. All I was doing was running away from some ugliness. Human ugliness. I’m not sure why I did it, but as I grabbed my purse and keys, I also grabbed my camera. As I drove away from our home, my attention was grabbed by the sky. After-the-storm, weighty clouds were hanging low against the streaks of pink, orange, and blue of the sunset. As that expanse of beauty hit my eyes, tears came. Only a few; a physical reaction to the tension between what was on display in the sky above me and what was on display in my heart that evening. 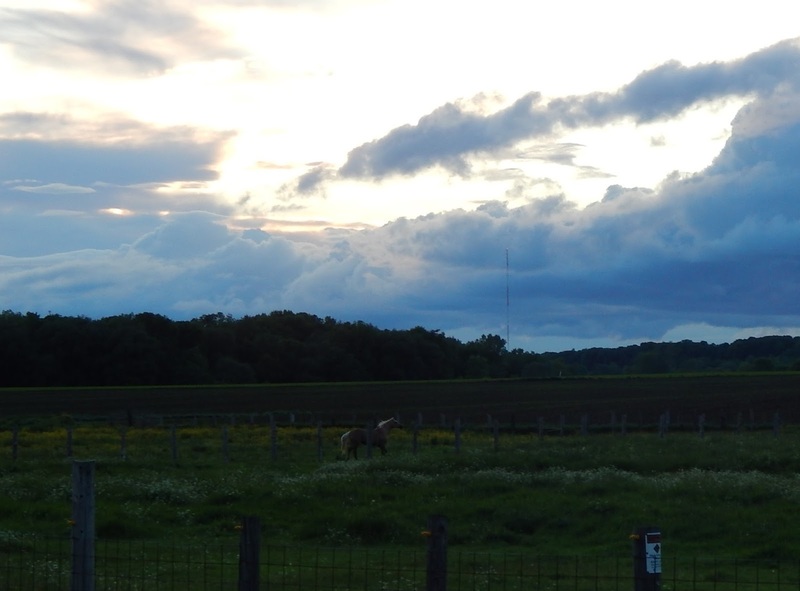 I sped down the county roads to an area full of farm fields where I knew there would be horses grazing in the twilight. I climbed out of my car and snapped picture after picture, swallowing the lump in my throat with each click of the camera. I knew I couldn’t really capture it all but I had the compelling need to try. This is what happens when something ugly collides with something beautiful. This is what happens when the fallen soul meets God. For God is beautiful and we were designed to need, to ache for, that beauty. Every single piece of beauty in this otherwise ugly world comes from Him. “Every good and perfect gift,” as St. James puts it (James 1:17). Because the beauty has God as its source, it is always more powerful than the ugliness. Is there anything more beautiful than the moments when we let it in? When we look upon the 27th sunset of the month and suddenly halt in awe at the sight; when the field full of dandelions transforms before our eyes from an acre of weeds to an acre of golden flowers; when the sound of the rain ceases to be a reminder of the mud that will follow and becomes a symphony of divine sustenance played for our planet. Those are the moments that get me through. Those are the moments when I know, I know, there is beauty in me. For I am made in the image of this beautiful God, and so are you, my friend.